Teen volunteers pack boxes at the Jewish Family Service of Central New Jersey Kosher Food Pantry. Diane Stein of Short Hills hates food drives. She works full-time hours at the Interfaith Food Pantry of the Oranges on a strictly volunteer basis (along with 10 other devoted board members, with the help of plenty of volunteers), and she much prefers picking up for their clients from the Community Food Bank of New Jersey in Hillside, which provides more than a third of their food. And although nearly a third of the Pantry’s food comes from food drives, and food drives serve an educational purpose, they definitely do not want that expired can of tuna in your cabinet. And Diane Weiss of the Bobrow Kosher Food Pantry in South Orange sees food drives as a gateway to more action. 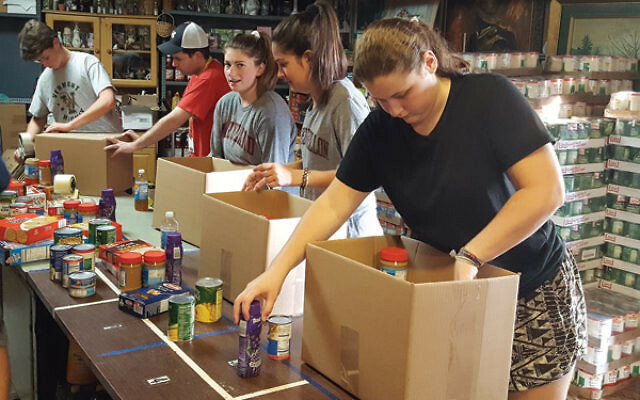 “It is a hands-on experience, which can lead to more action by individuals to help combat hunger in their community,” she wrote in an e-mail to NJJN. Feeding the hungry is a basic Jewish principle straight out of the Book of Isaiah, “Is it not to share your bread with the hungry?” the prophet asks regarding the meaning of the Yom Kippur fast (58:7-8), but how to go about sharing your bread is less clear. People want to help — especially this time of year when Hanukka is tied to generosity and giving — but food banks and how they go about their work is often misunderstood. You might say the devil is in the details. There are more than 1,000 soup kitchens and food pantries around New Jersey, and NJJN is taking a closer look at six enmeshed in the Greater MetroWest Jewish community: the Food Pantry of the Oranges, Interfaith Food Pantry of Morris County, Jewish Family Service of Central New Jersey Kosher Food Pantry, Morris County Soup Kitchen and Outreach, Jewish Relief Agency, and the Bobrow Kosher Food Pantry in South Orange (plus the state’s Community FoodBank in Hillside). The basic questions we seek to answer include, Who do these organizations serve? Where does the food come from? Where does donated money go? And what are the best ways to help? Jumping right to that last question, the answer is, of course, it depends, as demonstrated by Stein, Lake, and Weiss above. Although few will turn food away, some local food pantries and soup kitchens would prefer people volunteer, send money, or offer their skills. And many acknowledge that they can purchase food at deep, deep discounts from the Community FoodBank, so the money goes much further when donated directly to the service organization. Rabbi Moishe Gurevitz, who runs the Jewish Relief Agency in Morristown through the Rabbinical College of America, carefully screens food donations before accepting them. “We have a food assembly line. If we have multiple random items, people get confused as to what goes in each box,” he explained. JRA prefers a “balance of nutritional foods and quality foods,” he said, and many food donations don’t qualify for their boxes. If items are not appropriate, such as non-kosher food, he will refer people to other pantries. Even so, she said that the MCIFP works hard to remind volunteers to check the list of foods requested on the website, which is updated each week, so they avoid receiving strange or expired food from people’s home pantries. But unlike JRA, which is almost entirely volunteer run on a budget well under $100,000 per year, or IFPO, which runs on a budget just over $100,000 and is 100 percent volunteer run, the MCIFP has the resources and staff to organize the food drives, keep postings up to date, and educate the public. Its annual budget is $3.3 million and it has a staff of 18 employees, plus a regularly scheduled “staff” of 350 volunteers, in addition to those who come in to help on an ad-hoc or one-time-only basis. All of the organizations provide food to people in need, ranging from several bags of non-perishable goods once or twice a month to several hot meals served every day. Some provide other services as well. “Hunger in America,” a 2014 study produced by the umbrella organization Feeding America, of which CFBNJ is a partner, revealed that almost 900,000 people in New Jersey rely on food banks, and someone in need is fed 7.7 million times a year by a food bank partner charity. CFBNJ’s research from 2014 reveals that 43 percent of those it serves across NJ are children, 18 percent are elderly, 74 percent live below the federal poverty level, and 47 percent of households had at least one member who had been employed in the past year. Each of the agencies has different sources for food. Many, but not all, rely on CFBNJ; the food is not free, though it is deeply discounted. Like all food banks, it is required to charge a per-pound “shared maintenance fee” which distributes among partner agencies the operating costs of the food bank. The fee works out to about 18 cents per pound at the CFBNJ, according to Tim Vogel, director of food sourcing. Getting the food is not the big challenge locally because, as Vogel explained, “This is a food-rich part of the country, with lots of population and manufacturing.” Instead, the issue is logistics, especially when produce is involved. If produce is offered on a Thursday afternoon, for example, Vogel wants to accept it, but he also knows that because it’s late in the week and they don’t distribute food on weekends, “I have to think twice about that offer because I don’t know if it will last until next week,” he said. There are also strategic decisions — like how best to deploy its five trucks for pick-ups and deliveries. The USDA and the State of New Jersey also provide food, free of charge, and they distribute it through the Community FoodBank, so partner agencies pick up both their CFBNJ purchases and their free state and federal food all at the same time. Here’s an illustration of how it works from the agency side, using Diane Stein as an example. One Tuesday each month she places an order online, based on what is in stock. Then she rents a U-Haul and heads over to the Community FoodBank to pick up the order. The hulking warehouse is the size of five football fields and takes up an entire block, with giant rooms stacked high with canned food; refrigerated rooms that keep produce fresh; and a freezer storage room, the largest in the country. When she arrives some of the 175 paid employees at the food bank, having already received and packed her order, will load the food into the truck. The Community FoodBank distributes 44 million pounds of food this way each year. Several food banks, like the Morris County Interfaith Food Pantry and the Morris County Soup Kitchen and Outreach Center, rely on other sources, including restaurants and major grocery stores, in part, because the food bank is too far away for regular trips, according to Julie Hess of the Morris County Soup Kitchen and Outreach Center. Some, like the JFS of Central New Jersey Kosher Food Pantry, have started their own gardens. “The garden was an innovative way to add fresh vegetables to the food packages and provide an opportunity for community volunteers to be involved in helping,” said director Elie Bodner. When donations do arrive, volunteers sort and stack and shelve the items. And for those food pantries, like the IFPO, that don’t have their own space — it operates out of a church in East Orange — often the donations end up, frustratingly, on a volunteer’s porch. On a recent day, the Girl Scouts left 10 garbage bags of cans on Stein’s front porch. It fell to her to find a way to transport all the food to the church at a time convenient to the church. All of the food pantries try to respond to client preferences. As Diane Weiss of the Bobrow Food Pantry said, when they first opened people wanted tea and sardines and food they were used to eating, so the Pantry tried to accommodate those requests. Along the same lines, most of the food pantries have shifted from providing bags of food to providing a free “shopping experience” where those in need can pick their own foods from well-stocked shelves, thereby allowing, for example, a father who loves peanut butter but dislikes tuna fish to choose the right protein for his family. The Morris County Soup Kitchen and Outreach Center started offering a farmer’s market because, as Hess put it, they found there were many people with homes and kitchens who didn’t need a hot meal, but needed the fresh produce that was not otherwise affordable. Those delivering food often end up being an important liaison with the larger community. Because individuals and families with food uncertainty are often in need of other services as well, many of the delivery people provide referral services for everything from counseling to eyeglasses, and for those who are homebound, the visitors frequently find that, by default, they are responsible for checking in on the recipients and ensuring their well-being. Turns out, donating food is a lot more complicated than it seems when we carelessly drop that old box of pasta into the cardboard receptacle at our local synagogue. Continued in part two of NJJN’s series on “The Business of Food Banks”: Where the dollars come from and where they go.